We are fighting not for votes, but for heart of Ukrainians, - Klymenko in Korosten ⋆ News ⋆ Official website for Oleksandr Klymenko. 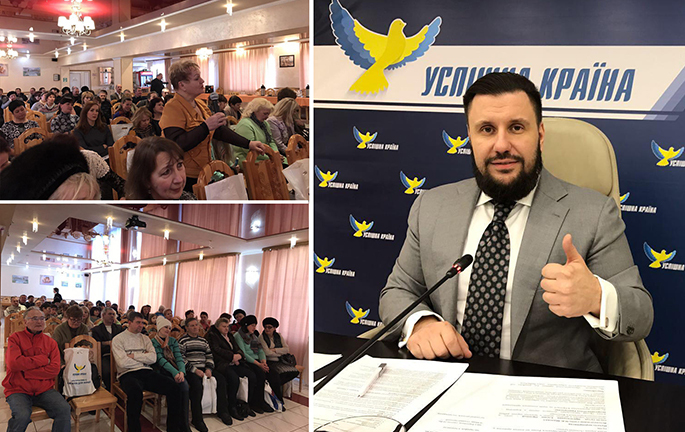 Oleksandr Klymenko – the head of the «Uspishna Kraina» party hold a meeting with residents of Korosten. During the discussion, it was raised the issues of Chernobyl, utility reforms, economic development, tax policy, armed conflict in Donbas. 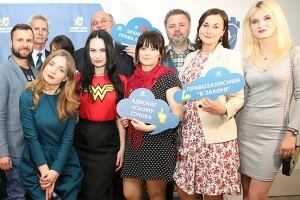 The meeting was opened by Olena Orlova, the head of the executive committee of Zhytomyr, and Olga Ogorodnyk, volunteer of the party in Korosten. They reported on the completed work and expressed future plans. About 130 people attended the meeting. Commenting on the situation related to cancellation of privileges for liquidators of the Chernobyl disaster, the leader of the party stated: “Firstly, even if the consequences of the disaster are reduced for Korosten and dozens of other cities, it does not mean that it should be deprived of support. Investors, additional funding and workplaces will not come here during a single day. Secondly, concerning the liquidators of consequences of the disaster – it comes about fair and deserved benefits, which were earned by human feat. Feat does not have time limits”. During the meeting, Oleksandr Klymenko stated that crime tariffs – it is a fatal mistake of the power. The head of the “Uspіshna Kraina” reminded that Ukrainian gas is delivered to citizens for imported fuel prices. It was also paid attention to further lending from the IMF. “Liquidation of the simplified tax system – it is a condition of further IMF loans. As well as raising the retirement age. As well as the quarterly review of gas prices. Neither the IMF, nor the government need a strong Ukraine. They want us to be weak. They want to pay Ukrainians USD 20 and send them to foreign production and make them to twist a nut. The best option is to make us and our children to be illiterate “, – Oleksandr Klymenko noted. Traditionally, the issue of restoring Donbas was raised during the meeting. The politician noted that it is important to have political will and stop to use the war as a folding screen for the benefits. The current government is not interested in this, due to the fact that it receives considerable dividends. It becomes richer day by day of the armed confrontation. During the discussion it was also raised the issue of payment of scholarships to students according to both social and academic results. It was noted the importance of apropos assistance and support to Ukrainian young people in order to reduce the threatening migration of young professionals. The head of the party emphasized the importance of obtaining high-quality and modern education. Moreover, he announced an educational project School of Young Leaders “An alternative exists. Path to success”. Let us recall that such meetings are the prerogative of the “Uspіshna Kraina”. That is why, it has been regularly carried out. Representatives of the party are confident that we can learn more about modern problems with the help of direct contact with population. It will allow to provide real help and support quickly.